CHOICE Outstanding Academic Title 2017 This book examines the 1871 unification of Germany through the prism of one of its `forgotten states', the Kingdom of Wurttemberg. It moves beyond the traditional argument for the importance of the great powers of Austria and Prussia in controlling German destiny at this time. Bodie A. Ashton champions the significance of Wurttemberg and as a result all 38 German states in the unification process, noting that each had their own institutions and traditions that proved vital to the eventual shape of German unity. The Kingdom of Wurttemberg and the Making of Germany, 1815-1871 demonstrates that the state's government was dynamic and in full control of its own policy-making throughout most of the 19th century, with Ashton showing a keen appreciation for the state's domestic development during the period. 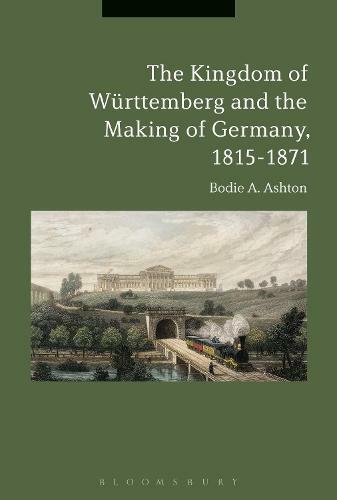 The book traces Wurttemberg's strong involvement in the national question, and how successive governments and monarchs in the state's capital of Stuttgart manoeuvred the country so as to gain the greatest advantage. It successfully argues that the shape of German unification was not inevitable, and was in fact driven largely by the desires of the Mittelstaaten, rather than the great powers; the eventual Reichsgrundung of January 1871 was merely the final step in a long series of negotiations, diplomatic manoeuvres and subterfuge, with Wurttemberg playing a vital, regional role. Making use of a wealth of primary sources, including telegrams, newspaper articles, diary entries, letters and government documents, this is a vitally important study for all scholars and students of 19th-century Germany.